I am very excited because recently I took a trip off to Byron Bay in Australia, one hour from the Gold Coast to collab with a brand I love. It was one small step but a massive leap for my wee brand. I legit cannot believe it but with not much time and a lot to do before I flew out I wanted to make sure I was bringing my best me and had everything packed that I could need. 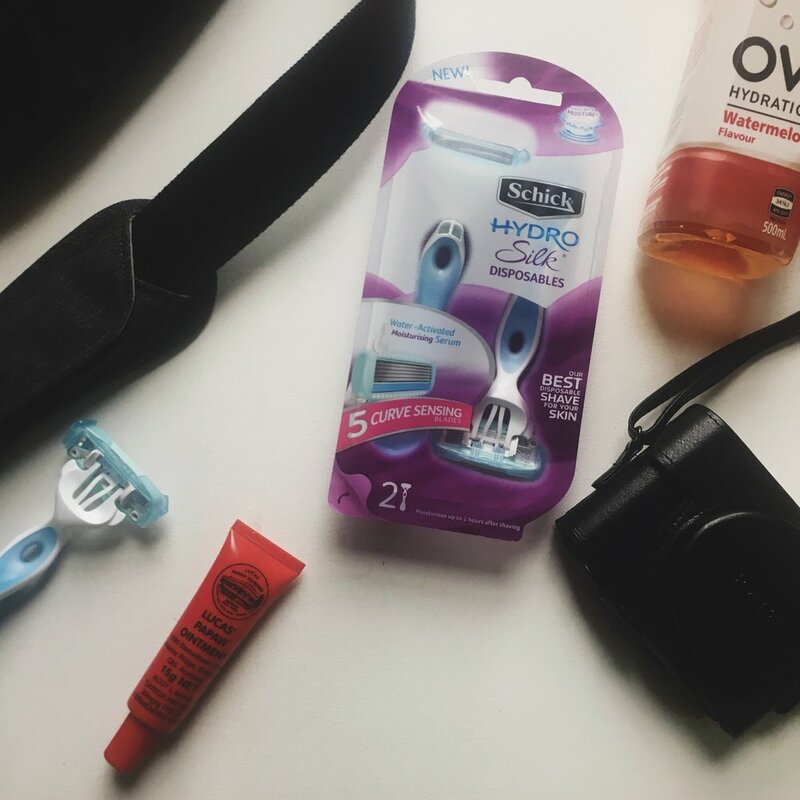 Schick Hydro Silk Disposable Razor - If you're looking for a reliable, quality disposable razor in time for Summer – especially if you’re hitting the road for an adventure - then look no further. The ultimate travel essential, this razor is a convenient way to experience your usual, favourite shave while away from home. It features five curve-sensing blades with skin guards to smooth skin as you shave and reduce irritation, while a water-activated moisturising serum in the blades works to hydrate skin for up to 2 hours after shaving. Sometimes when I travel I don't know exactly what I’ll be doing (and let’s face, I’m probably in a rush!) but at least I can trust that my Schick Hydro Silk will deliver a perfect shave - I was definitely leg ready for my photo shoot and the sun! Summer Pj's - These are always easy to forget. For me, I usually just wear an oversized man's shirt to bed (recently a Superman one) so I decided to invest in some summer pj's - I headed into Cotton On Body and they had some like Mexican ones, and I was like perfect. Especially with Mexico happening! Did I mention I am off to Mexico next year? Chapstick / Lip Balm - Traveling on planes or through countries (even states) means a change in climates. Pack a Chapstick or Lip Balm and your lips will love you for it. I forgot mine on this trip and had to pick up a stick at the airport, it cost twice as much! So lesson learnt! My new SONY RX100 got its first holiday - I bought this camera after my trip to America, and I'm so excited to finally take it on holiday. In fact, I'm even going to try and make a vlog with the content I got! Watch this space. Macpac ITOL Duffel - Of course when luggage is tight you want to pack only the essentials, so I couldn't forget my ITOL duffel. It easily stows away in ‘the overhead locker,' carrying all of your essentials on short travel trips including that Schick Hydro Silk disposable razor and of course a sleeve for my laptop - it was a business trip of course. What are your travel essentials? I have a Schick Prize Pack, valued at $50 to giveaway, just comment below your travel essential by December the 6th and be in to win.